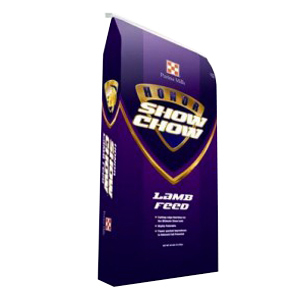 Honor Show Chow Ewe Pellet provides supplemental protein, minerals and vitamins for gestating and lactating ewes. This non-medicated pellet contains all the vitamins and minerals necessary for muscle growth and body condition. Healthy ewes produce healthy show lambs. Get your gestating and lactating on Honor Show Chow Ewe Pellet today! For reducing the incidence of vibrionic abortion caused by campylobacter fetus infection susceptible to chlortetracycline. Honor® Show Chow® Ewe Pellet is designed to be fed to gestating and lactating ewes. If ewes have not been accustomed to consuming high energy feeds, gradually adjust ewes to Honor® Show Chow® Ewe Pellet. Once ewes are adjusted, feed Honor® Show Chow® Ewe Pellet at the rate of 1 to 1.5% of bodyweight per head per day during gestation. Feed 1.5 to 2% of bodyweight per day during breeding and lactation. Also offer a good quality roughage source at all times. It is important to allow free access to clean, fresh water at all times. We also suggest allowing ewes free access to sheep mineral. Reminder: Feed is perishable and should be stored in a clean, dry, well-ventilated area so it will remain fresh and palatable. DO NOT feed moldy or insect infested feed to animals as it may cause illness, abortion or death. Fresh, clean water should be available at all times.